Fall is Free at Crystal Bridges! Here’s how to spend the perfect fall day at your museum! Foghorn’s is giving away a recliner every Sunday for 15 weeks of the NFL football season this year! Here’s how to enter. Lunch Counter Cards are now available at JBGB. Get it stamped each visit, and after five, your lunch is free! Maxine’s will host a fundraiser and live art action titled Artists For Sonia for city council candidate Sonia Gutierez on Sunday. Details. 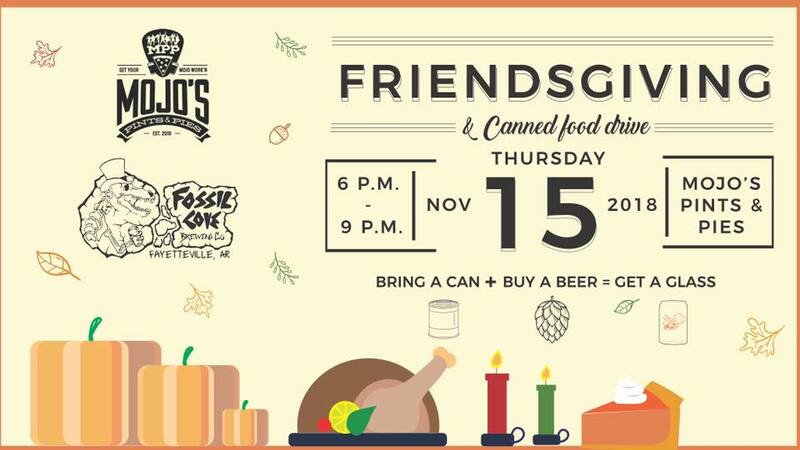 Mojo’s Pints & Pies is planning a Friendsgiving Canned Food Drive on Thursday from 6-9 p.m. Bring a can, buy a pint, keep the glass! TheatreSquared’s Gala for Education and Access is Thursday, Nov. 16. Featuring a performance by Alton Fitzgerald White (Lion King). Walton Arts Center has fun shows coming up with The Nutcracker, John McCutcheon, On Your Feet, and more! Thanksgiving menu from Southern Food Co.
Tenderloin burger, shrimp po-boy, chickpea patty melt, and more. Check out the awesome lunch menu at Bordinos! Want to have your mind blown? Check out the Buffalo Chicken Stuffy Pizza from Damgoode Pies. Get a large three topping pizza for just $7.99 at Eureka Pizza. Order online here. Kids eat FREE every Monday-Wednesday at Flying Burrito Co! Grub’s has $2 well drinks every day for happy hour from 3-9 pm! Sure, it’s cold. But that just makes the beer cheese soup from Hugo’s taste even better. Get barbecue cheese fries for just $5 every Saturday at Lucky Luke’s BBQ! Ozark Natural Foods has fun classes coming up in November! Butternut and Pumpkin cooking, Friendsgiving, and more! Need smoked turkey, ham, and sides for your Thanksgiving feast? Order now from Penguin Ed’s! Razorback basketball season is here, and so is Mike’d Up at Sassy’s! Need help with your holiday meal? Let Southern Food Company do the cooking! 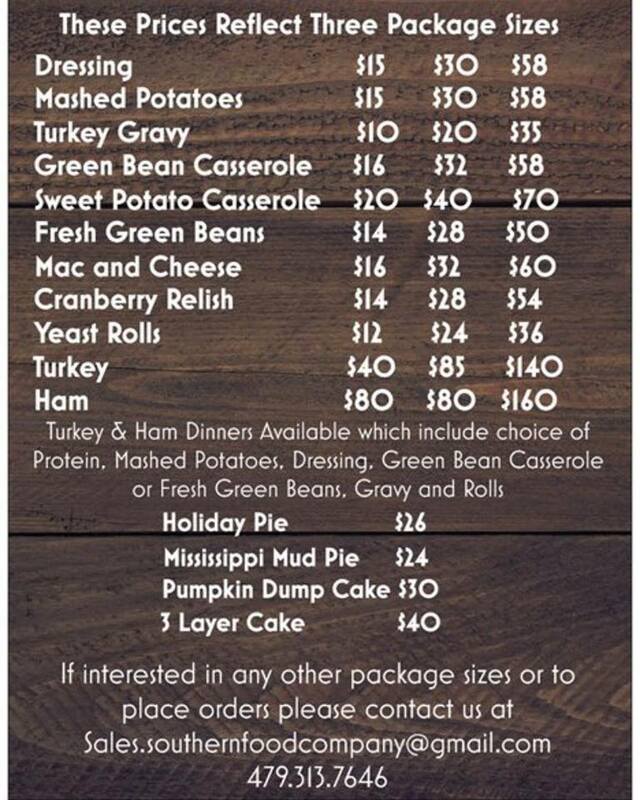 Check out this Thanksgiving Menu! Need food for your holiday visitors? Check out the catering options at Slim Chickens! It’s soup season, and Taziki’s has some delicious options. Try their Hot Tomato Basil Soup with a Grilled Pimento Cheese sandwich! Austin Vision Care now has an optical showroom at their new location at 571 W. Martin Luther King Jr. Blvd. For medical, cosmetic, and med spa needs, Premier Dermatology has you covered for all things skin! No dental insurance? No problem. Check out the awesome dental savings plan from Beavers & Broomfield! Washington Regional has formed a pastoral support group for women who have experienced loss through stillbirth or miscarriage. More info. Specialized Real Estate Group just celebrated the LEED certification of their Uptown Fayetteville Apartments + Shops development! Need some more space for your family? Check out this new 3,166 square foot listing in the Rolling Hills neighborhood from Flyer Homes. 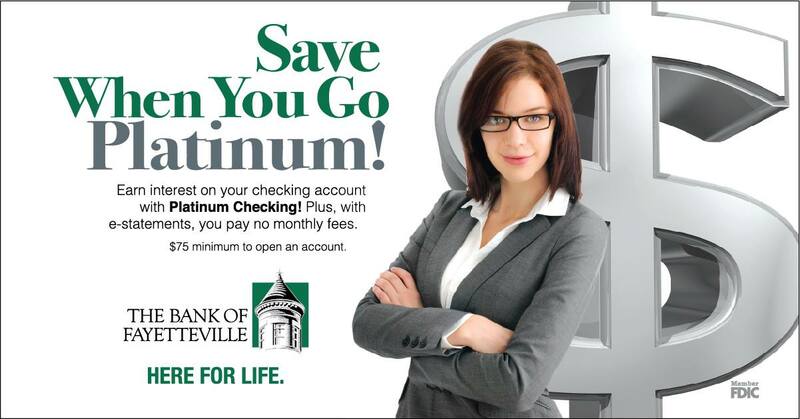 Earn interest on your checking account with the new Platinum Checking account at Bank of Fayetteville! Click to learn more. Having computer trouble? It’s nothing the local experts at GCM Computers can’t solve. Open a First Savers account at FNB NWA for your little one, and watch their money grow with a 2.5% interest rate! Details. Have peace of mind when completing your Mortgage Loan with Uark Federal Credit Union! Adventure Subaru’s Share the Love event begins Nov. 15. Subaru will donate $250 to charity for every new car sold! Fayettechill makes the environment a priority. It’s goods for the woods that are good for the woods! Join Jumble Hub today and start saving money on everything for your kitchen and home. New Auctions daily or buy it now and pick up locally. Get 20% off all political merch at Something Urban Code w/ code “Vote” this week. Instore or online! Riffraff just dropped their Holiday Collection of Tees for this year, and they are pretty great. Look. Hundreds of little decisions go into every piece of jewelry created at Underwood’s. 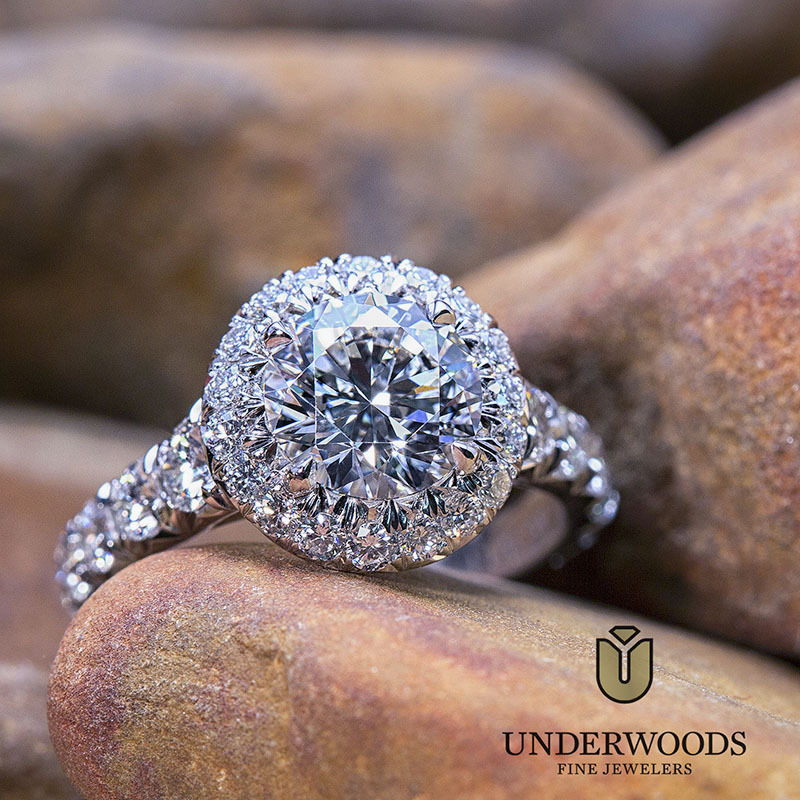 Each Underwood Diamond has a character of its own and it’s our passion to showcase that unique beauty in an expertly designed setting crafted by generations of experience. Quality, Beauty, and Value. It’s more than a promise, it’s our legacy.